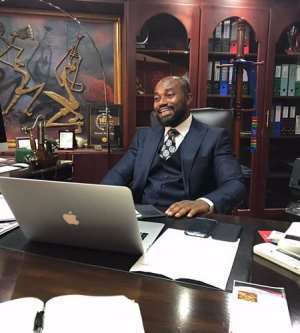 Chief Executive Officer of the Ghana Chamber of Young Entrepreneurs Sherif Ghali Abdulai is calling on entrepreneurs in the country to emulate the Chairman of the McDan Group of companies Dr. Daniel McCauley in running their businesses. "For McDan, he will accept any opinion from people from all walks of life but when it comes to taking decisions, he is always firm and will not budge even when pushed", he stated. "This attitude is what we as entrepreneurs need to ensure that our businesses strive", Mr. Ghali stressed. The CEO of GCYE also called on entrepreneurs to have time in terms of following processes at any office they go to. This he believes will go a long way to weed out the canker of paying unapproved money to individuals in order to facilitate services rendered to them . He said, " the reason we have issues with offices such as the Regista General's Department is that, most businessmen will claim they have no time to wait for a service so they end up paying cash to middlemen to have it rendered for them at a faster rate. If we continue this way, we will always have problems such as the payment of facilitation fees to middlemen", he added. The Multi-Stakeholder Business Integrity Forum was organized by the Ghana Integrity Initiative to seek the views of the business community on how to curb corruption at public places. Participants at the forum called for systems to be allowed to work in order to ensure corruption is cleared.